The ability to listen to the same music across multiple network players. Some know this as 'party mode'. The ability to send the audio from whatever is connected to your PC's analogue input (a radio, for example) to the same network players. 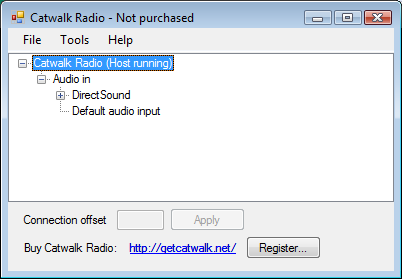 Catwalk Radio is implemented using industry standards, and interoperates with any uPnP aware hi-fi equipment. It is now in its second beta release, and we are looking forward to hearing from you, via mailbox@transmissionbegins.com. There are instructions for using it. Your existing uPnP network media collection, controller and players. A cable to connect the two!